We already discussed how to clean a matress, now let’s talk about comforters. They keep us warm and cozy at nights but they can get dirty pretty quickly. We sweat as we sleep so that’s one reason to clean your comforter once in a while. Check the label of your comforter to learn all the vital maintenance care instructions from a manufacturer. 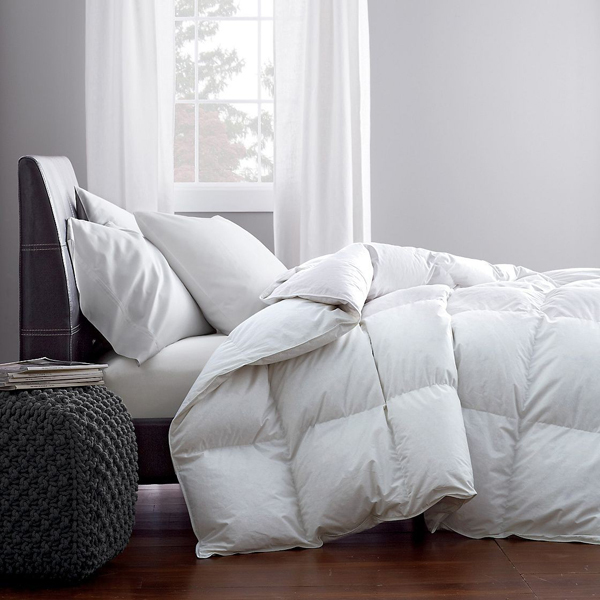 If your comforter is machine washable take it to a Launfromat and give it a spin on a gentle circle and warm water. Dry cleaning is also an option and some comforters come with ‘dry clean only’ care instruction on their tag so think about choosing such a comforter if you are not ready to take it to dry cleaning once in a while. If you wash this kind of comforter it may ruin it or at least make the filling shrink or cause fabric change color. You can hand wash your comforter in a bathtub or you can spot-clean before loading it into a laundry machine. It can be useful since the cool or warm water and gentle cycle may leave some stubborn stains. Learn what fabric your comforter is made of and clean the stain with appropriate products. Let your comforter air dry after washing it, evenly spread it accross the drying rack or other clean surface. Once it’s dry put it in a duvet cover as it’s much more convenient than a sheet under a comforter. It stays intact throughout the night preventing sweat getting into comforter and preventing stains. Besides, it’s much easier to wash than a comforter. Thanks for this useful post. Drop by my blog as well sometime as I specialise in !